Nikki Haley surprised the American and international foreign policy establishment by announcing her intention to resign as U.S. ambassador to the United Nations, effective at the end of this year. While President Donald Trump indicated he had known of her desire in this regard for some time, the announcement took virtually everyone else in the Trump administration—including Secretary of State Mike Pompeo and national security adviser John Bolton—by surprise. Unlike previous senior-level administration departures, which were charged with acrimony and angst, Trump went out of his way to praise Haley, holding a news conference at which he complimented her for her work. The reasons for her decision are stated as “personal,” and speculation abounds about potential causal factors. But at the end of the day, Haley’s resignation was a political act carried out by a political person for her own personal political gain. To back up this assertion, here’s a bit of background about her political evolution. The daughter of Sikh immigrants, Nimrata “Nikki” Haley was schooled as an accountant and cut her teeth as a businesswoman by assuming various positions in her mother’s upscale women’s clothing establishment. Born and raised in South Carolina, Haley became a rising star for women in the Republican Party, a woman of color who embraced the conservative Christian-based ethos of the Deep South. She was a non-threatening figure in the eyes of those who would become her target demographic once she left her family business for a career in politics. In 2004, she won a seat in the South Carolina state Legislature, where she campaigned on a GOP-friendly platform of reducing taxes. Haley was, by all accounts, a deft and capable political operator, pursuing conservative policies across the board. In 2009, encouraged by then-Massachusetts Gov. Mitt Romney, Haley announced she would run for governor of South Carolina. She won the election after receiving the support of former Alaska Gov. Sarah Palin, vice presidential running mate of presidential candidate Sen. John McCain and (at the time) the darling of the American conservative establishment. Once established in her role, Haley eschewed national politics—at first. She turned down an opportunity to be Romney’s running mate in the 2012 U.S. presidential election; instead, she ran for re-election in 2014, winning handily. As governor, she backed conservative causes as she sought to further South Carolina’s fortunes. She oversaw the emergency response to Hurricane Matthew in 2016, and she faced controversy when she ordered the Confederate flag removed from the state Capitol in the aftermath of the racially motivated 2015 mass shooting at a Charleston church. Her status as a minority female, combined with her record of capable conservative governance, made her an ideal candidate for national-level politics, and she was widely touted as vice presidential material in the 2016 U.S. presidential election. She was an early supporter of Sen. Marco Rubio, R-Fla., and later, after Rubio withdrew, Sen. Ted Cruz, R-Texas. In a moment of significant national exposure, Haley was chosen by the GOP to deliver the Republican response to President Barack Obama’s 2016 State of the Union address, during which she singled out then-presidential candidate Trump for criticism. Yet once her former adversary emerged as the Republican candidate, Haley was quick to jump on the Trump train. After Trump won the 2016 election, she interviewed for a Cabinet-level position and was tapped to be the U.S. ambassador to the United Nations. It was a job for which she was singularly unqualified. An ambitious politician in her own right, it was no secret that Haley viewed herself as someone who could one day take the top job at 1600 Pennsylvania Ave., and thus she knew a high-profile assignment at the United Nations would not only increase her visibility nationally but would also help her gain critical national security and foreign policy experience, both of which her resume clearly lacked. Under normal circumstances, heading up the U.S. Mission to the United Nations (USUN) would be an ideal place to carry out on-the-job training in the field of international relations. Foreign policy is made in Washington, D.C., and implemented in New York, where the United Nations is headquartered. The job of the USUN, a facilitator and implementer of policy as opposed to conceiving and framing policy, is to advance U.S. foreign policy objectives to the rest of the world—the perfect setting for a novice to cut her teeth while being guided by a seasoned staff of experts. The U.S. ambassador to the U.N. is not traditionally a Cabinet-level position per se. However, starting with the Ford administration in the 1970s, the position had been granted Cabinet-level status. This practice ended under President George H.W. Bush, only to be reinstated under Bill Clinton. Like his father, George W. Bush rescinded Cabinet status; then Obama reinstated it. In a break from past Republican practice, Trump agreed to keep it a Cabinet-level post, acceding to one of Haley’s preconditions for accepting the job. Typically, the detrimental consequences of appointing someone without any foreign policy experience to a Cabinet-level diplomatic post could be offset by ensuring they are adequately back-stopped by the rest of the national security/foreign policy team, especially a strong, experienced secretary of state. Trump’s initial appointment of Rex Tillerson to lead the State Department, along with Mike Flynn as national security adviser, represented the antithesis of such a move. These factors, combined with the wholesale flight of veteran diplomats from the State Department following Trump’s election, meant Haley would be assuming her post lacking the kinds of bureaucratic and procedural checks and balances one would normally expect to see in place prior to her starting date. The USUN is one of the most sensitive and complex diplomatic posts in the American foreign service, requiring a firm but deft hand combined with tact and patience. By design, it is not intended to be used as a blunt instrument of American foreign policy—again, not under normal circumstances. But there has been nothing normal about the presidency of Donald Trump. In late 2016, after the outgoing Obama administration refused to employ a veto to block U.N. action targeting Israel, then President-elect Trump condemned the action (or lack thereof), bemoaning on Twitter that the U.N. had “such great potential” but it had become “just a club for people to get together, talk and have a good time. So sad!” He later ominously noted “things will be different after January 20th,” referring of course to the date of his inauguration. Tillerson was never able to establish firm footing as secretary of state, overseeing, as he was, a department comprised of staffers whose morale was collectively in free fall and undercut at every step by a president who viewed himself as America’s most senior, all-knowing diplomat. Haley, on the other hand, thrived in her role as the administration’s mouthpiece at the United Nations. On matters of foreign policy, there was no semblance of originality vis-à-vis the White House emanating from USUN, or even an effort to take into consideration the viewpoints of the rest of the world. In the my-way-or-the-highway global view of Trump, the U.N. became little more than a podium from which America issued its demands and organized its retribution for anything less than absolute subservience. Haley played her role to a T, issuing dictates, threats and demands without displaying any notable grasp of the underlying issues or her office’s past negotiating history. In the fact-free world of the Trump administration, in which inciting global angst is considered a good thing, Haley’s purportedly muscular diplomacy played well—until it didn’t. Haley was a loyal soldier to Trump, aggressively advocating for what passed for policy. In this she was no different than those who had preceded her. Indeed, there was little to separate her condemnation of Syrian President Bashar Assad, or Russia’s support of the Assad regime, from that of her predecessor, Samantha Power, when it came to tone and content. But the difference between the two was discernible. Power—an Ivy League-educated foreign policy wonk whose book on the Rwandan genocide garnered her a Pulitzer Prize and the attention of her future boss, Barack Obama—was at least conversant in multiple aspects of a given issue and able to engage a wide variety of topics freely and without notes. Ambassador Haley, on the other hand, carefully operated from a script prepared by others, reading her notes and rarely venturing into the world of free thinking. She had no experience to draw upon, lacking both academic and practical preparation. She was the dutiful puppet, unashamedly raising her hand to be the sole vote cast against a resolution condemning Trump’s precipitous decision to move the U.S. Embassy in Israel to Jerusalem, and then woodenly holding up the images of stricken Syrian civilians as part of an orchestrated campaign to justify military action against the Syrian government. She lambasted the Russians and Chinese, insulted virtually every other nation and international institution, and threatened to “take names” when nations dared oppose the policies she fronted. 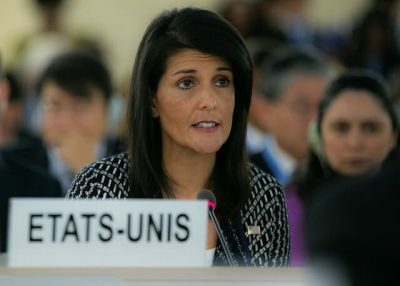 Haley was at the forefront of America’s retreat from multilateral engagement, leading the charge as the United States withdrew from U.N. treaties and agreements (the Paris Accords and the Iran Nuclear Agreement foremost among them), slashed America’s financial contributions to the U.N. and its affiliates, and otherwise denigrated anything that didn’t directly benefit the U.S. In her defense, she was not the author of these policies, only the face the Trump administration used to sell them to the rest of the world. But as every able politician understands (and Haley is, if anything, an able politician), perception is its own reality, and as the individual who gave voice and presence to these actions, she now owns them forever. It’s not as though Haley was constitutionally incapable of independent thought—far from it. Her experience as South Carolina’s governor proved she can be a savvy and self-reliant politician, able to weigh costs and benefits when making difficult decisions. Perhaps the most difficult decision Haley had to make, then, was to allow herself to be used in such an egregious fashion so that she could build a resume capable of sustaining and supporting her own aims. She showed flashes of independence, not on matters of policy but rather personal morality, challenging the president on his Muslim ban and insisting that women who claim to have been sexually assaulted have a right to be heard. But these isolated moments of autonomy could not hide the reality that at the end of the day, Ambassador Haley was little more than a puppet. Her days were numbered with the resignation of Tillerson and the departure of H.R. McMaster as national security adviser. In the confusion that reigned in the White House during the transition from Tillerson to Pompeo, Haley got caught out as she advanced a policy position regarding Russian sanctions that was outdated, prompting a comment from within the White House she was “confused.” “I don’t get confused,” she snapped back. This was in April 2018, about the same time she reportedly first indicated to the president she was looking to leave. Unlike Tillerson and McMaster, Pompeo and Bolton ran a tighter ship. Bolton in particular was opposed to the idea of the U.S. ambassador to the U.N. enjoying Cabinet-level status, having noted during his time at USUN that “it overstates the role and importance the U.N. should have in U.S. foreign policy,” adding that “you shouldn’t have two secretaries in the same department.” There could be only one voice fronting for U.S. foreign policy on behalf of the president, and it would no longer be Haley’s. Trump did his part to make Haley’s exit appear dignified and positive. She, too, played her prescribed role, making it known she was not positioning herself to become Trump’s political rival in 2020 while also offering she planned to make her opinions on policy matters known from time to time. Perhaps she will assemble a team of foreign policy experts to help her better shape these opinions, allowing her to continue the artifice that she somehow possesses depth when it comes to issues of diplomacy and foreign relations. In the shallow world of current American politics, Haley is a master at shaping perception. One thing is for certain—barring some unforeseen turn in her career trajectory, this isn’t the last the American people will be seeing of Haley. She is far too ambitious, far too intelligent and far too “glamorous” to simply fade away. Trump hinted at a possible future role in his administration—perhaps secretary of state during a hypothetical second Trump term. And there is always 2024. Haley would be 55 years old, ideally situated in the prime of her life to make a run for the most powerful job in the world—that is, if America still retains the status of unmatched global superpower. Present circumstances suggest this may not prove to be the case. For all his rhetoric about “making America great again,” Trump is presiding over the greatest loss of power and prestige in American history, not insignificantly because of policies Haley helped promote and implement. And while her departure from the role of U.S. ambassador to the U.N. appears perfectly timed to insulate her, at least in the minds of the American electorate, from the consequences of any future political catastrophe that might befall Trump, the rest of the world is not so easily confused, possessing superior memory and a grasp of a reality to which Haley’s ambition seems to have blinded her. Featured image is from Eric Bridiers /United States Mission Geneva / Flickr)(CC BY-ND 2.0.